– Found a technique to execute DLL files without being detected by autoruns.exe at logon. – Requires administrator rights and does not belong in userland. reg add HKLM\SOFTWARE\Microsoft\Windows\CurrentVersion\RunOnceEx\0001\Depend /v 1 /d "C:\temp\messageBox64.dll"
To me this meant that if I added these keys, the processes would probably execute directly in the parent process. It also meant that I could add a list of dependency DLL files that would be executed. That was very interesting and got me really curious. It states that HKEY_CURRENT_USER RunOnceEx should execute for local admins, but this was not the case when I did the testing. However I did get execution using the HKEY_LOCAL_MACHINE hive. The documentation that I linked to at the top of this post also includes some examples. As you can see, it is possible to either specify an executable by using ||exename.exe or dll file by using DLLFilename|FunctionName|CommandLineArguements. I found that /Explorer parameter by running strings.exe against the runonce.exe binary. A thing I noticed when I was playing with this, was that the dll file must be registered. So it seems that you cannot just plant a dll file and execute it using this method. After I was done “playing” with this I decided that I would look into the part about dependent DLL files. And this is where the research became very interesting. In the documentation (screenshot below) it gives an example using “depend”, but it is unclear and I had to try and fail some times before I got it right. 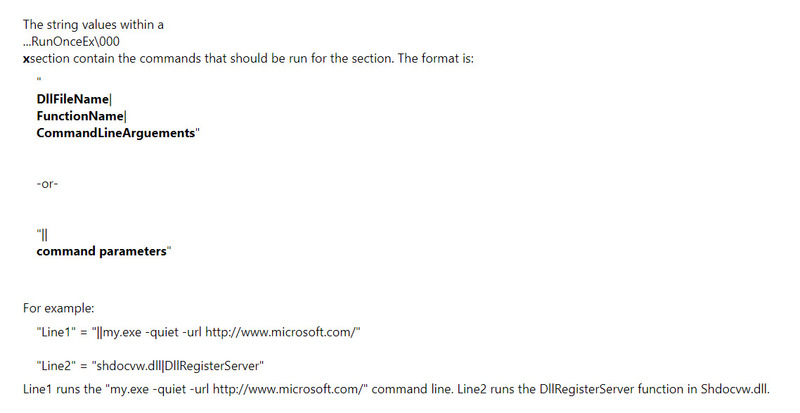 Just by adding this registry key, the dll file you specify will execute on next logon. The cool thing about this method is that it hides completely from autoruns.exe. Below is a video showing this technique. I guess that this technique has already been used by other threat actors already. This is just another forgotten thing in Windows. I know that this technique requires local administrator access, but still I find this interesting enough to blog about. Hope you liked it. Mark Russinovich was thankful for the discovery and stated that this will be added in the next version of Autoruns. i test in my windows server 2012 pc,when i add “”Line1″=”||c:\windows\system32\notepad.exe”” ,autorun doesn’t detect it. Notepad.exe is a Windows binary. To detect it you have to unhide Windows entries from Autoruns.exe. or use a non ms signed binary.